You Could Be Dead in Seconds! When you feel drowsy you should pull over as soon as its safe to do and either swap drivers (making sure that they are not also drowsy too) or, arrange accommodation to sleep, or if this is not practical, have a 15 minute Power Nap. Otherwise within just one micro-sleep you could be involved in a violent crash and never make it home at all. And remember, that a micro-sleep could be within ten minutes of home where statistically most drowsy-driving crashes occur. What makes drowsy driving so life threatening is that drowsy driving crashes can happen at either low or high speeds. Not only this but there is no deceleration. It is not surprising that drowsy-driving crashes are so lethal. When planning to meet people, don't be too rigid about your arrival time. Allow some leeway for breaks and Power Naps. "John died in his sleep... He was warm and comfortable.. and doing 100 km/hr on the open road." Drowsy-drivers aren't just putting themselves at risk, they're also putting their passengers as well as other road users, cyclists and pedestrians at risk. 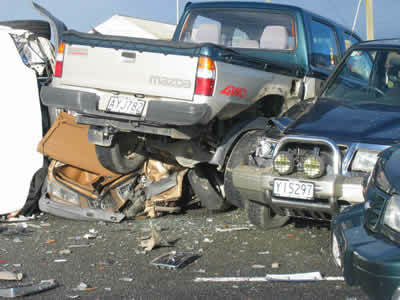 Drowsy driving on New Zealand roads is endemic. New Zealand drivers are simply unaware of the causes and effects of drowsy driving. If you experience excessive daytime sleepiness, don't ignore it or cover it up. It's a significant medical condition which needs to be diagnosed and treated. If you continue to drive not only are you a potential danger to yourself but also to your loved ones and other people. A car in the hands of a sleepy person is like playing Russian roulette with a randomly pointed one tonne bullet. Drowsy-driving crashes can cause the worst type of road crashes because there is no deceleration (the vehicle is travelling at full speed), no attempt to avoid objects, and are without warning. It is not surprising that drowsy driving crashes have the highest percentage of deaths by crash category. Drowsy-driving crashes tend to be more violent than drink-driving crashes because even a drunk driver has some ability to react and respond to an emergency situation, even if a drunken impaired ability. That is, unless the drunken driver has also fallen asleep. Then just like a sleeping sober driver, there is no ability to react or respond. But a driver who is sleepy doesn't react to an emergency situation at all because they're unaware there is one ! When drivers fall asleep at the wheel, the results are catastrophic: one car ended up with four occupants dead. The financial and economic costs to New Zealand of drowsy driving is huge and this is before the social costs of pain, grief and suffering are considered. In the USA, sleep deprivation and sleep disorders have been costed at over $ US 100 billion annually in lost productivity, medical expenses, sick leave and property and financial damage. In New York police estimate that 30% of all fatal crashes along the city 'thruway' occurred because of drivers falling asleep at the wheel. For commercial vehicles, driver fatigue* is the single most significant cause of road crashes accounting for up to 60% of crashes See definitions section on the use of the term fatigue* and fatigue on this website.